WESTON, CT. Jan. 2, 2013 – After a 12-month conservation and management study of its popular 1,009 acre Trout Brook Valley Conservation Area, Aspetuck Land Trust today announced new trail use policies that carefully balance the protection of one of the region’s most important ecological areas with the use of the preserve for hiking, dog-walking and other passive recreation. The year-long study by Connecticut Audubon Society’s conservation services staff working under contract for the Aspetuck Land Trust was designed to better identify the wildlife and ecologically fragile areas within the preserve. This will enable the Land Trust to make more informed decisions about managing the property for both conservation and public use purposes. Trout Brook Valley is one of the most important ecological features of Fairfield County. It forms the core of a 6,400-acre expanse that serves as the “green heart” of the region, according to the Connecticut Audubon Society report. Trout Brook Valley was destined to become a private golf and country club enclave dotted with 103 luxury homes. In 1999, Aspetuck Land Trust led a coalition of local groups including the state of Connecticut and the Nature Conservancy to acquire the land and incorporate it into two preserves it owned to the north and south. This created what is now called the Trout Brook Valley Conservation Area, one of the largest blocks of undeveloped land in Fairfield County. “It’s our responsibility to manage and preserve Trout Brook Valley for future generations, and we now have a plan to do this based upon the scientific findings in this report. Our next step is to better educate the public about this unique and important natural resource,” said David Brant, Executive Director of Aspetuck Land Trust. Connecticut Audubon Society’s conservation biologists spent hundreds hours over four seasons performing fieldwork at the preserve and analyzing data. They conducted surveys of birds and amphibians, which both are indicators of ecological health, and assessed the habitat quality and ecological functions of the preserve. The report also recommended strategies to help protect the flora and fauna that make the environment so rich and beautiful. Providing Conservation Services for landowners is a key component of Connecticut Audubon Society’s strategy to fulfill its mission of conserving the state’s birds and their habitats. For more information, visit our Conservation Services page. The preserve encompasses mixed hardwood forest, forested wetlands and scrub-shrub wetlands, seasonal pools, early successional fields, grasslands and orchard, numerous brooks and streams, and talus slopes. 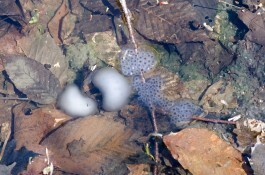 Dozens of vernal pools and other wetlands are home to species such as Spotted Salamander, the eggs of which are shown here. Spotted Salamanders lay their eggs in early spring. Photo copyright Connecticut Audubon Society. Native Brook Trout and American Eel live in the preserve’s streams. Its wetlands support an array of reptiles and amphibians, including Spotted Salamanders, Marbled Salamanders and the state-listed Jefferson’s Salamander. The bird populations are abundant and diverse, and include 156 species and numerous species of conservation concern including 21 state-listed species. The new policies will go into effect April 1, 2013, affecting the existing 21-mile trail system at Trout Brook Valley used by hikers, mountain bikers, equestrians, dog walkers, birders, and others who enjoy the preserve. Until that time, dogs must be leashed at all times throughout the preserve to allow Aspetuck Land Trust time to make trail and signage modifications and to better protect the environment and preserve the abundant but fragile wildlife diversity that exists. Aspetuck Land Trust allows off leash dog walking on all of its other forty-one nature preserves with the exception of the Newman Poses preserve in Westport where dogs must be leashed. Beginning April 1, dogs will be required to be leashed throughout the property under their owners control and to remain on designated trails at all times to better protect the environment and preserve the abundant but fragile wildlife diversity that exists. Off-leash dog walking will be allowed, however, on a two mile trail loop in the Crow Hill section of Trout Brook Valley and will be accessible by four public parking areas. Hundreds of dogs can visit Trout Brook Valley on a busy weekend. The cumulative impact when dogs go off trail can be harmful, according to the Connecticut Audubon Society’s research. 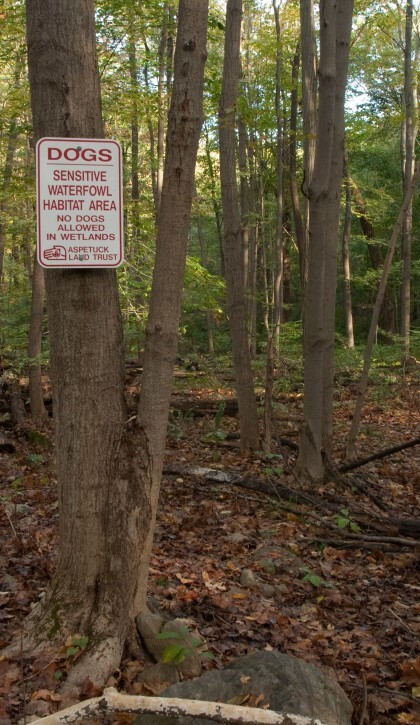 The Crow Hill section of Trout Brook Valley was designated for off leash dog walking partly because it has no vernal pools which are particularly delicate environments. For more information on the Trout Brook Valley Conservation and Management Plan, visit www.aspetucklandtrust.org. You can download a 10 mb pdf of the Conservation and Management plan here.